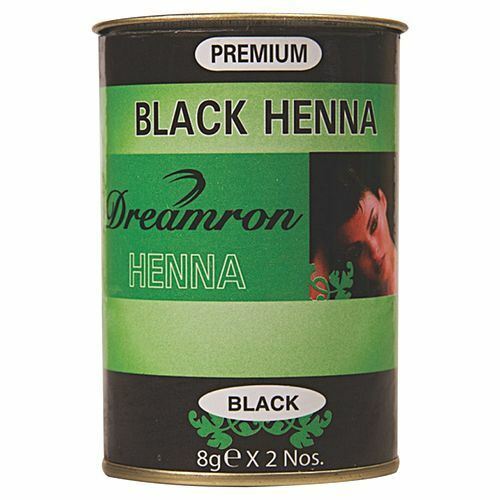 Dreamron Henna comes from the dried leaves of Indian Henna Shrubs and gives a long lasting natural black shade to your hair. It is manufactured to the highest Japanese standard of quality and gives maximum safety for your scalp. Adds excellent black shade to your hair with extra shine. Consisting natural moisturizers prevent your hair from drying. No unpleasant odor when mixing & applying. Added mild ingredients cause no harm. Prepare a loose paste of Black Henna with warm water in a plastic or a glass bowl. Comb the hair and divide it into sections. Apply the Henna paste on the hair thoroughly. Leave the pasted hair for 30-40 min. to absorb the color. Then shampoo the hair using a mild shampoo & wash it until rinsing water becomes entirely colorless. Finally towel dry the hair. Caution Please carry out the allergy test if the product is being used for the first time, as it might cause skin irritation or allergies with some people. If the product, contact with your eyes or skin, rinse immediately with plenty of water. If irritation persists, consult a doctor. Always wear gloves throughout the entire process. Never use the product if your scalp is irritating or injured. Never keep any prepared mixture for future application. It should not be used to dye eyelashes or eyebrows.